The GM1 is a mini GH3 with some rather interesting new technology under the hood (a sensor that does a full pixel 4.5K readout in silent shutter mode) for just $749 (with 12-32mm lens) – but could the unthinkable be true and it actually shoots better video than the GH3? 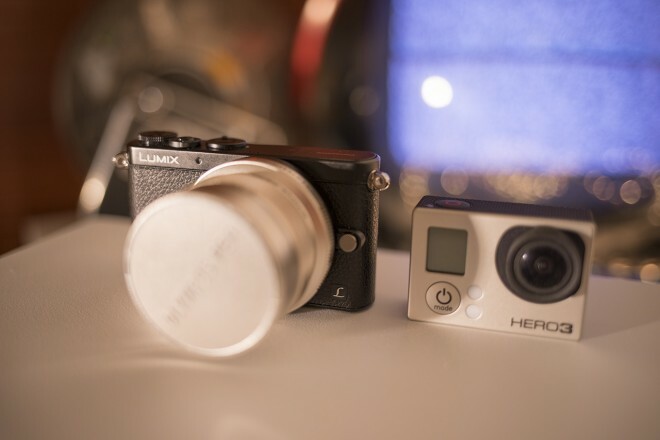 The GM1 is an extremely small camera, even smaller than the Pocket Cinema Camera and not for everyone. 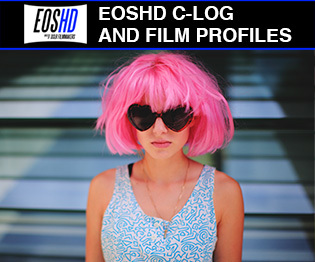 It has possible pro-filmmaking uses as a stealth camera, vehicle mounted camera or B-camera. It certainly has use as a crash-camera or something you put in a VERY tight corner to get an unusual angle where a big camera won’t fit. But enthusiasts I feel will love this camera because it is A) cheap B) small and C) an improvement in some ways on the flagship GH3. The GM1’s new sensor is a generation on from the older Sony sensor in the GH3 and made by Panasonic this time. Panasonic’s sensors have always been underrated. They tend to have very fast readout speeds and much better pixel binning algorithms which benefit video quality. Here the sensor does a 6×6 pixel mix in 1080p producing an image which is sharp and with minimal moire and aliasing. There’s no line-skipping going on, and it’s a superb performer in low light. This is certainly an interesting sensor from a technology stand-point, because of the rumours this chip will go into a 4K shooting GH4 in the future – it’s already been announced as a stand-alone part on Panasonic’s website which does 10bit 4K video. That claim is partially backed up by the fact that the GM1 sensor can do a 4.5k resolution full pixel readout to produce raw stills (and JPEGs) with a completely silent electronic shutter. Impressive! Panasonic seems to have resisted the temptation to cut the GM1 down from the GX7 just because it’s a cheaper and smaller model. This is practically the same spec but tiny and minus the EVF. 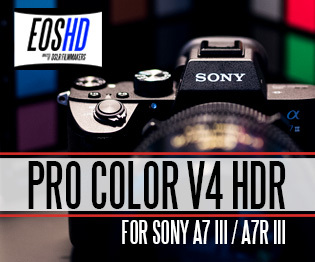 Could we be getting a preview of what a 4K video shooting GH4 with beefed up image processor will look like? Well if we are, colour me impressed because the 4.5K stills are very nice from the GM1 shot with the electronic shutter. The only drawback of using the silent shutter mode is there’s a risk of rolling shutter skew with Michael Bay action scenes, or even trainspotting with a lot of passing trains… so for those with thick rimmed glasses and lunch boxes you’ll be best off switching it to mechanical shutter mode. Yes they managed to fit a mechanical curtain in it – which is quite astonishing. One other thing to watch out for with the electronic shutter is if you’re shooting under certain kinds of practical light at high shutter speeds or speeds not synced to that country’s electricity supply – this can cause banding across the frame. The GM1 is a surprise in low light. At ISO 3200 the GH3 has a lot of brown noise crawling over the image and detail begins to smudge. The GM1 here outperforms the GH3 with a much cleaner image with less noise and richer colour. 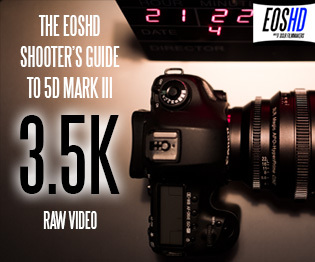 It’s actually on par with the best Super 35mm cameras for video like the Nikon D5200 for low light. But it resolves more fine detail than the Nikon and has more features, despite being the size of a compact camera. It’s precisely as a genuine compact camera where the GM1 impresses. It feels like a Canon S120 with an interchangeable lens mount and large sensor. That’s a huge advantage over any existing compact. It’s this that makes the GM1 hands down the best compact camera solution in the world right now. Nothing else can touch it for size and image quality combined. 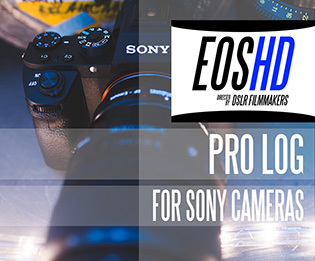 It thrashes the nearest competitor, the already quite capable Sony RX100 Mk 2 for image quality in video mode. The 12-32mm F3.5-5.6 zoom that comes with the camera is not as fast at the wide end as the RX100’s Zeiss fixed zoom but it covers the larger sensor whilst adding a barely perceptible amount of weight to the body. It’s one of the smallest Micro Four Thirds lenses available (including the smallest primes). My favourite lenses to use with this camera are the equally pocketable fast primes from Olympus. The 12mm F2.0 and 45mm F1.8 are so small and light you can carry the whole system with 3 lenses around with you in 3 jacket pockets, without a camera bag. The GM1 is the smallest interchangeable lens camera on the market that does large sensor video. 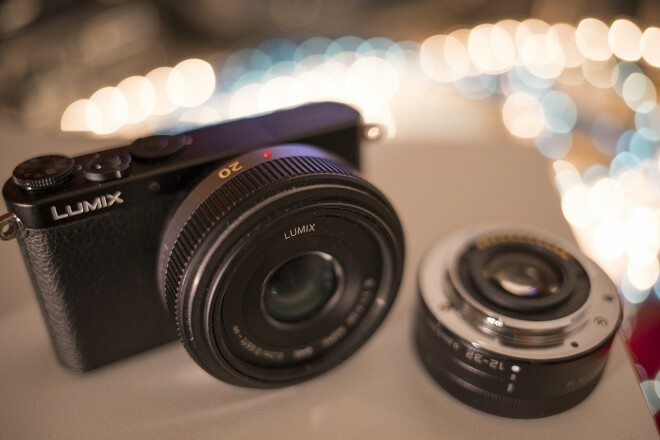 To get a sense of how small the GM1 is, this is a camera that the Lumix 20mm pancake lens looks too chunky on! The pancake is larger than the GM1 from top to bottom. It’s barely any taller than a GoPro. It’s definitely a pocketable compact but unlike the Sony RX100 this is an interchangeable lens camera. With c-mount lenses attached you can lose it down the back of a sofa. Any lens with a slightly larger diameter than the Micro Four Thirds mount itself will dwarf the GM1. The Voigtlander Nokton 25mm F0.95 is a nice looking lens on this camera as it exactly matches the diameter of the mount and doesn’t cause the body to rock side-to-side when placed on a desk. How stealthy is it? Well let’s just say the days of taping up your silver Leica M with black tape are over. Just by gripping the GM1 and putting your other hand around the lens you conceal the entire camera and only the front of the lens is visible. It’s a very nice camera for reeling off a quick shot. 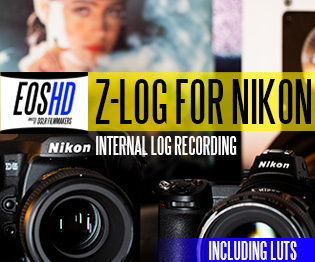 Lenses like the Voigtlander 25mm F0.95 are now jacket pocketable. Before I struggled to fit my OM-D E-M5 or GH3 in my largest jacket pocket. With the GM1 it feels like you’re carrying just a lens and not a camera! The display has a crisp feel to it and good contrast. With a Zacuto Z-finder or similar on the back you basically have a nice director’s viewfinder too. The camera is so small it feels like you’re bolting the Z-finder straight on the back of the lens. For a very small camera the controls are surprisingly good to handle even for those with large hands. They have really got the feel of the rear dial right. It is tactile and responsive. The control scheme is unfussy. Certainly less fussy than a NEX. But there’s a real lack of programmable buttons! Does this matter? Not so much – because you have a programable Q-menu. You also have an array of touch screen function buttons from Fn2 to Fn5. I’ve assigned ISO to the physical Fn1 button on the top plate. 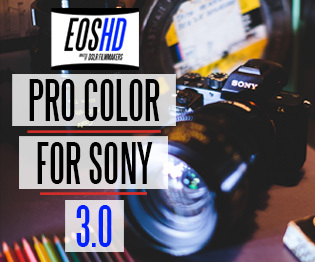 You have direct access to white balance, drive mode, manual focus assist, AF focus type, exposure mode and there’s a switch to change between AF-S, AF-C and MF. But for everything else you need to use the q-menu. The battery isn’t much smaller physically than the Nikon EL20 in the Blackmagic Pocket Cinema Camera but it’s only rated for 7.2v 680mAh compared to 7.2v 1020mAh on the Pocket. The GH2’s battery was a 7.2v 1200mAh. However it seems to hold up pretty much OK, though not outstandingly so. Unlike the GH3 the new GM1 has fully configurable peaking and whilst it doesn’t work as well as on the Blackmagic Pocket Cinema Camera (sometimes outlining the edge of bokeh!) it’s a useful feature. If you find peaking distracting then the punch-in focus assist is sharper than on the GH3. It also has a windowed ‘picture-in-picture’ mode which works very well. Panasonic have chosen not to remove very much from the GX7 and GH3 in creating the GM1 and it’s paid off, for this is an excellent camera in its own right for shooting high quality video and stills. It’s a great alternative to the Blackmagic Pocket Cinema Camera for those who want a larger sensor and smaller file sizes. 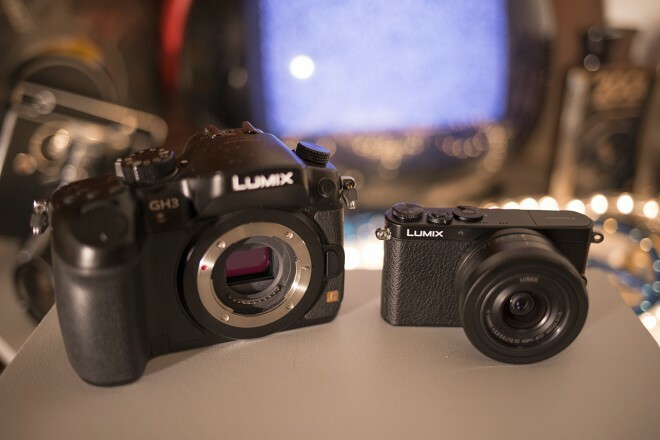 The new Panasonic sensor is also excellent and a significant improvement on the GH3’s Sony sensor in low light. 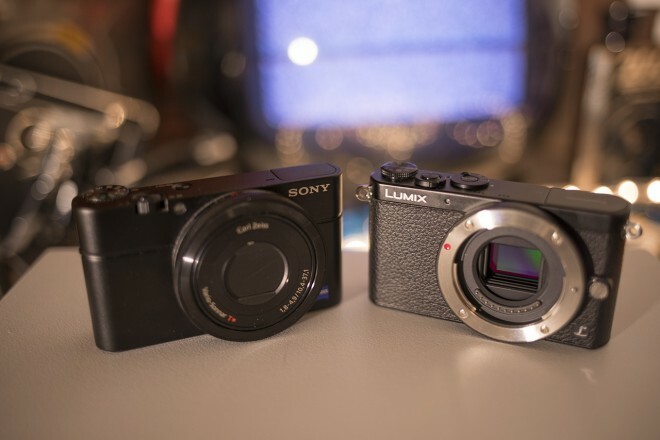 Unlike a compact camera such as the RX100 you can choose to pair the GM1 with a larger fast aperture prime, or pair it down to a tiny Olympus fast prime like the 45mm F1.8. The GM1 is the first compact with a F0.95 lens if you fit a Speed Booster or Voigltander / SLR Magic F0.95 lens to it. Even with these lenses it remains jacket pocketable. The 0.71x Metabones Speed Booster for Micro Four Thirds on this camera will give you a field of view just a bit wider than APS-C and Super 35mm, whilst gaining you another 1 stop of low light performance. The Contax Zeiss 50mm F1.4 goes well with the Speed Booster on this camera and it remains jacket pocketable. 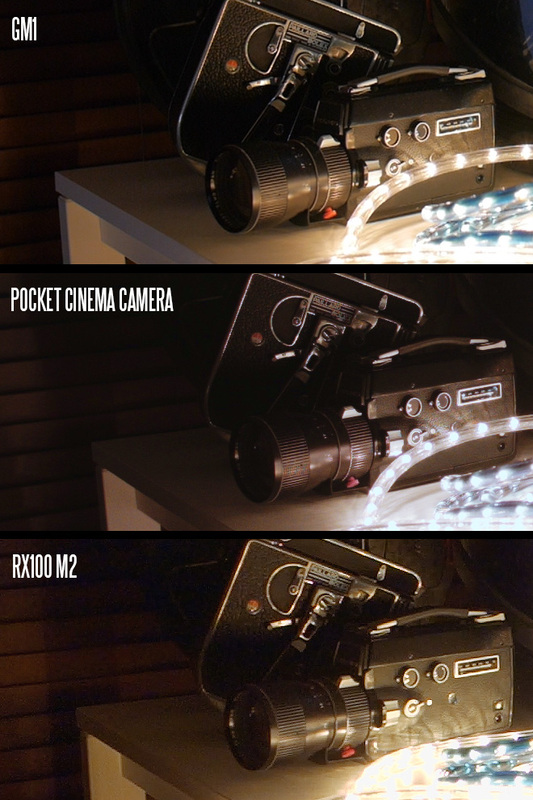 Anamorphic sample footage shot with the SLR Magic Anamorphot – and which lenses go best with it?